especially if it is used to make low value products such as packaging. But using such plastic as a replacement for bitumen is cost-effective, claims Mr McCartney. As an example, he says that a tonne of bitumen might cost around 400 pounds ($521) in Britain. A recycled-plastic additive for a standard road works out at 300-350 pounds a tonne. The additive would replace a proportion of the bitumen, so there are savings to be made. At present 5-10% of the bitumen is replaced by the additives, but this could be increased to 25%. Mr McCartney decided to develop specialist recycled-plastic additives after watching a practice sometimes employed in India to repair potholes. Plastic waste collected by pickers is piled into the hole and then set alight with diesel to form a molten mass. It is crude and polluting, but it provides a fix of sorts. A number of roads in India are also made by mixing chopped-up plastic into bitumen. Australia is another country that is starting to recycle plastic into roads. 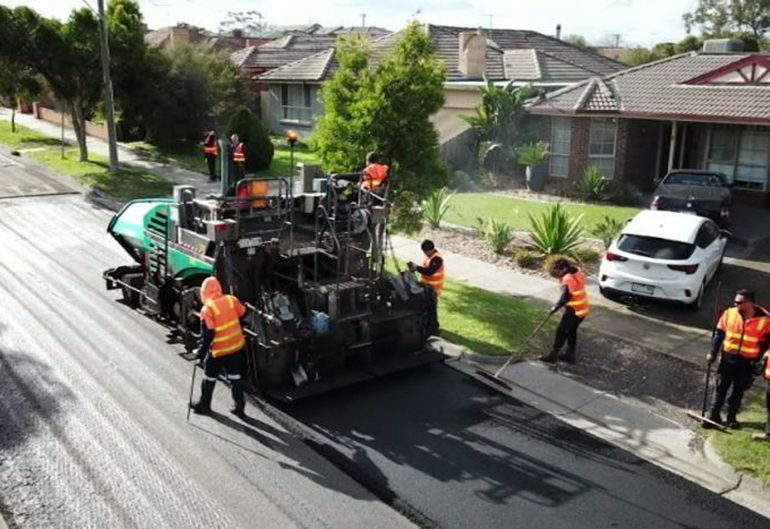 Earlier this year a 300-metre stretch was completed in Rayfield Avenue, Craigieburn, a suburb of Melbourne, using a substance called Plastiphalt. This consisted of recycled material from more than 200,000 plastic bags and packaging, 63,000 crushed glass bottles and toner from 4,500 printer cartridges. All this was blended into 50 tonnes of reclaimed asphalt to create a total of 250 tonnes of road-building material. The road will be monitored to see how it performs. the cost of using the recycled materials was comparable with building a road in the usual way. But the road is expected to last a lot longer and prove better at coping with heavy traffic. is equivalent to what Rayfield Avenue's residents would have put into their recycling bins over the past ten years. One of the biggest complaints to local councils is about the state of the roads, especially potholes. Households in Australia and elsewhere might well do more sorting and recycling of plastic if they knew it could result in a smoother drive. The price per pound works out at $3.20. Maximize the use of local, reclaimed and recycled materials, and use materials with low embodied energy. This is equivalent to losing half a month from each lifespan.